The campus community is invited to attend an open presentation titled, “Gender in Negotiation: Lessons for Men and Women.” The event will take place on Wednesday, April 3, 2012 at 1pm in the Alumni Room of the Memorial Union Building. Alice F. Stuhlmacher is a Professor of Psychology at DePaul University in Chicago. Her research interests include negotiation and conflict in organizations, particularly relating to gender, labor mediators, and virtual communication. She has been active in applying meta-analyses to summarize existing research and has also published research relating to personality, workplace safety, and decision making. Her Ph.D. is from Purdue University in Industrial-Organizational Psychology. She has served as program director of the Ph.D. program in Industrial-Organizational Psychology and as affiliated faculty in the M.S. in Human Resources at DePaul’s Graduate School of Business. In addition to conference presentations and publishing, she has been an invited speaker to various groups such as Women in Science, Women in Business, Georgetown University’s Gender in the Workplace Research Initiative, and Harvard University’s Gender in Negotiation Research Seminar, and is excited to join us to discuss gender issues in the workplace. Stuhlmacher’s visit is part of the Visiting Women and Minority Lecturer/Scholar Series. This event is funded by the Michigan Tech President’s Office and a grant to the Office for Institutional Diversity for the State of Michigan’s King-Chavez-Parks Initiative. For more information about Alice Stuhlmacher, see her profile on the DePaul University website. Assistant Professor of Marketing Junhong Min will present on March 6th at 1pm in AOB 101. 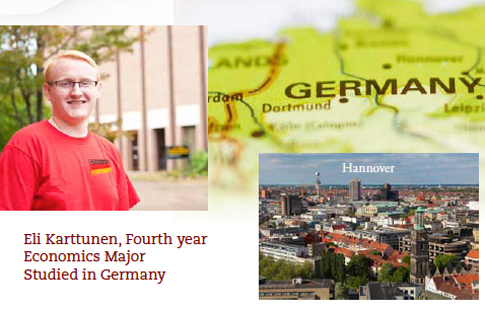 Eli Karttunen, a fourth year economics major studied in Germany during summer of 2012. Why did you study abroad? Studying abroad allowed me to see how economics and finance courses are taught from a European perspective. Also, to take classes with foreign professors and students gives you a large networking advantage, as well as the chance to work in multicultural teams, all of which are invaluable experiences for graduate school, as well as later in life. All too often, it seems that economics has the potential of being taught from a politically skewed or nationalistic point of view,so understanding how Germans view different economic theories or events like the European Sovereign Debt Crisis was appealing. The first part of the program was a course on German language,culture, and business, which is designed to not only give the US students a working vocabulary and knowledge of German language and grammar, but also to provide insight to German culture and political institutions. Students present on a variety of topics and have to write a paper by the end of the program. I presented on “The German Banking Sector” and “The German Social Security System.”So far, the difference has been that homework and projects aren’t that big in German education. It’s all about the exam grade. In fact, for university classes, you don’t actually register for them here, you just attend the lectures you want, memorize the note packet the professor sends out, and you register for exams and take them. Nothing else is graded. The best part of the trip is simply being in Europe and being able to travel around and experience the culture. So far, we’ve been to Hannover, Hamburg, Amsterdam, Berlin, and Luneburg. With travel plans to Rotenburg, Munich, Heidelberg, and Helsinki the capital of the land of my ancestry in Finland. Would you study abroad again? Would you go somewhere new or to the same location? Study abroad is an invaluable experience in many ways: academically,professionally, personally, and socially. You learn of new ideas, new ways of doing things, and meet tons of people you’d otherwise never have known. I definitely would do it again, given the opportunity. Germany is a great place, and I’m sure I’ll return someday, perhaps for work—I’d definitely need to learn more German first—but for sure for vacation some day. But in order to see other places around the globe, I’d probably want to check out somewhere new! Originally published in Impact, Fall 2012. 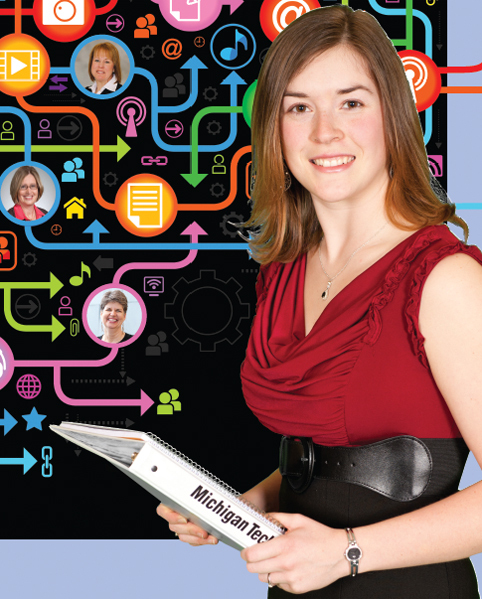 Caitlin Pionke '12, a management major at Michigan Tech, talks about how she used networking to secure a job at Dow Chemical in Midland, Mich.
“Networking” is no more than a vague concept for many students, something they might do in a far-off professional future. For management major Caitlin Pionke, networking came into play far earlier as a crucial job-hunting tool. Like many graduating students, Pionke started her job search in a tough, highly competitive market. Pionke’s networking opportunities came on the heels of her 2011 Woman of Promise award in the School of Business and Economics. Michigan Tech’s Women of Promise program, which was initiated in 1999 by the Presidential Council of Alumnae (PCA), is a way to recognize a female student in each department who goes above and beyond what is expected of them. Students who win the award gain an introduction into the network of alumnae who have been recognized for outstanding professional achievements. Using tools like LinkedIn, she branded herself as a strong communicator and promoted her experience as the business team leader for the International Business Ventures group, a member of the Beta Gamma Sigma national honor society, and a small business owner. Pionke’s hard work and strategic job hunt paid off. By the time she arrived at Dow Chemical’s booth at the job fair, company representatives knew her by name. After several rounds of interviews, Pionke accepted a position as an information analyst in the company’s IT department, which she will start in June 2012. PCA members pictured, top to bottom, are Ellen Horsch ’78, Carrie Schaller ’87, and Marie Cleveland ’82. Originally published in Impact, Spring 2012.